Travel through time in this classic trolley as you ride through the historical districts of Salt Lake City. Your colorful Conductor and magical Motorman will entertain you with dozens of tales in a theatrical fashion! See elegant mansions, ornate churches, grand architecture, and stunning mountain views. The Salt Lake Trolley Experience is a "Sightseeing Show" you'll never forget! Your "Sightseeing Show-Tour" of the top attractions of Salt Lake City starts when you step aboard a historical replica trolley in front of the Family History Library of Temple Square in the morning or early afternoon, depending on option selected. During a 90-minute loop around the city, see interesting sights while your Trolley Conductor and Motorman, in colorful costumes, entertain you with fascinating stories and fun history. The 15-mile (24-km) route includes sights such as Temple Square, the Utah State Capitol, the historical districts home to 100-year-old mansions and cathedrals, the Salt Lake City Union Pacific Depot, and more. 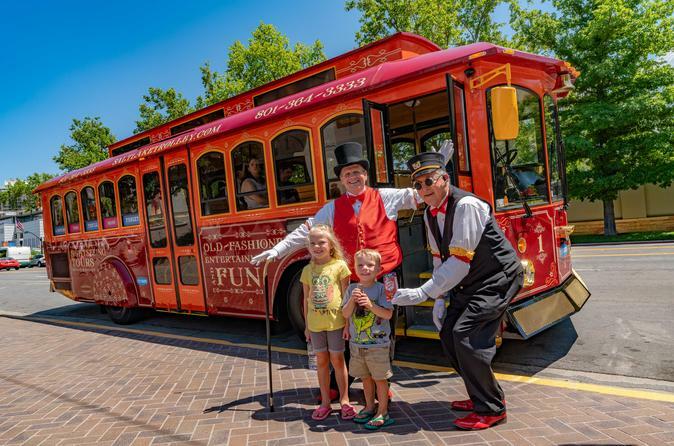 Riding aboard a colorful trolley is great fun for people of all ages and is also ideal for those who want to see the highlights of the city but don't have the time for a half-day tour.